One of my favorite snacks is a chocolate Vitatop with fat free Cool Whip. The Vitatops are so good, but SO expensive. 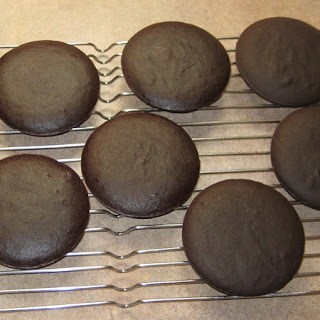 So after buying a muffin top baking sheet at a garage sale, I decided to create my own Vitatops. You can find the original recipe here. I altered it to my liking. Combine all the wet ingredients in a bowl. Add the dry ingredients and stir until smooth. Pour a scant 1/4 cup of batter into a muffin-top pan (if you don't have a muffin top pan, you could probably make these in a regular muffin pan or just pour the batter into 1/4 cup mounds on a baking sheet). Top with a sprinkle of chocolate chips, if you're using them. Bake at 350 for about 10 minutes. Remove from the pan and let them cool. Wrap individually and freeze. When you're ready to eat one, just unwrap it and nuke it in the microwave for 20 seconds. I love these topped with Cool Whip! I got 9 1/2 muffins by using a full 1/4 cup. You could stretch it to 10 muffins if you use just barely shy of 1/4 cup of batter.